Classic Copenhagen street scene, including bikes and a cargo bike ridden by a Supermum in heels. City Hall Square one day. Blue on blue with a poncho-clad Supermum. 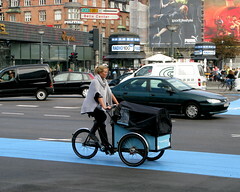 For more about Danish cargo bike culture, I have an article online at The Los Angeles Times right here. is only a matter of time before the rain in Amsterdam catches up to Copenhagen! As usual great imager. helmets, in my opinion, are not fashionable. village mama... i'm working on it! great idea! I love this image. I would love to be that woman one day.